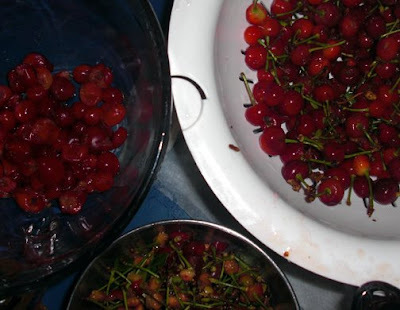 We pitted the cherries. 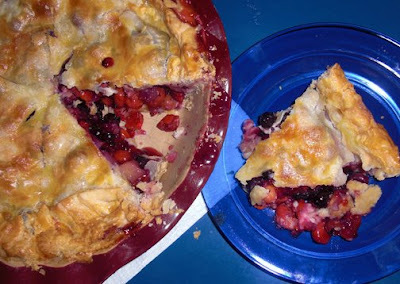 We baked the pie. We ate the pie. Mix the cherries and blueberries with the sugar, tapioca, zest, juice and extract. Let sit for 15 minutes.Line the bottom of a deep 9 inch pie plate with first crust. Pour in berry mixture. Top with sliced peaches. Top with second crust, pinch edges together. Brush with egg wash and sprinkle with sugar. Cut 4 slits in the top crust. Place the pie on a foil lined cookie sheet, there will be drips. Bake at 375 degrees for 55 - 65 minutes. 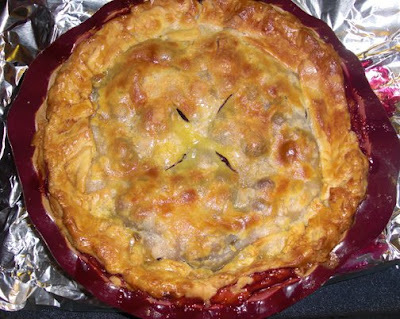 After 20 minutes you may need to cover the outer edges of the crust with foil to prevent the crust from browning too much.